Retardant Drop Planes drop retardant on hot spots on Tuesday, June 26th. Photo by Allene Dana. Trees torching Torching trees put up thick black smoke. Photo by Allene Dana. Fire moving south The Horse Creek Fire moved south of Pass Creek Wednesday afternoon. This photo was taken from the Ryegrass-North Cottonwood Creek Road. Triple Peak is in the background, looking west. Photo by Dawn Ballou. Helicopters working fire There are 4 helicopters working the Horse Creek fire now, one Type I, 2 Type II, and 1 Type III. Photo by Allene Dana. Smoke from Space Perry Walker downloaded a satellite image showing the smoke plume from our fire as of Tuesday afternoon at 5:00 P.M. local. The arrow shows the smoke plume. The Wind River Mountain Range sits to the right of the plume. Tuesday smoke The fire moves south from Horse Creek into the Pass Creek area on Tuesday. Photo by Allene Dana. House on a hill This beautiful home is threatened by the fire. Photo by Allene Dana. Helicopter on fire A helicopter with a bucket flies near a hot spot on the fire. Photo by Allene Dana. Huge smoke column The fire put out a thick column of smoke on Wednesday. This photo was taken from the Ryegrass-North Cottonwood Road around 5PM. Photo by Dawn Ballou. Update 11:00 AM Thursday, June 28: Officially, the Horse Creek Fire grew to 5,363 acres by Thursday morning, increasing by 2,362 acres since yesterday. The noon report Wednesday placed the fire size at 3001 acres. Photos in this update are by Allene Dana and her daughter Heather Kavran, and by Dawn Ballou of Pinedale Online! Allene and Heather's photos were taken between Monday and Wednesday. Dawn's were all taken on Wednesday, June 27, between 3-7 PM. One structure, a private home, became threatened by this fire on Wednesday and structure protection is in place. Crews and equipment are on the ground and using helicopters to protect this home. Fire managers are calling the blaze 15% contained and say it is very likely they will achieve their projected containment date of next week on Monday, July 2nd. The fire has been progressing southeast and southwest of the original point of origin in the Horse Creek drainage. On Wednesday it crossed over Pass Creek and is �well established� in the Elk Creek drainage, which is the next drainage south of Pass Creek on the east side of the Wyoming Range, north of McDougal Gap. The Forest Service has posted new maps of the fire perimeter on the Inciweb website (see related links below). The fire is burning in lodgepole pine, alpine fir and engleman spruce forest, bordered by open sagebrush expanses (BLM and private land ownership) in the South Horse Creek and North Cottonwood Creek drainages. Six lightning strikes were reported south of the fire on Thursday, according to the Forest Service. The National Weather Service is forecasting mostly sunny weather, with the possibility of isolated showers and thunderstorms, for northwest Wyoming today. Erratic downdraft winds from thunderstorm cells could impact the fire direction in unpredictable ways. This fire threaten one private residence located north of South Horse Creek, at the edge of the timber. Reports from people living in the area say the home was still intact as of this morning, although the fire has burned all around it. We were told this morning that flames have also scorched a significant amount of summer cattle pasture for several ranchers. Residents reported plane retardant drops on Tuesday (see photo). The fire started in the Horse Creek drainage, west of Sherman Guard Station, in the Wyoming Range west of Daniel on Thursday, June 21st. 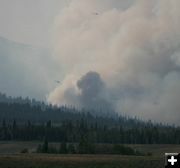 The blaze stayed in the Horse Creek drainage until the weekend, then crossed over the ridge south into the Pass Creek drainage on Sunday evening, growing quickly in size. The Merna Butte ridge has not burned. There is minimal fire activity going north of Horse Creek now. The majority of the blaze has moved south between Horse Creek and Ryegrass-North Cottonwood Creek roads. No cause for the blaze has yet been determined. Fire management transitioned from a local Type III crew to a Type II management team headed by Merrill Saleen on Tuesday, June 26. See the Forest Service report below for more on current resources battling this fire. The Horse Creek Road is closed to all but authorized fire personnel. The Sublette County Sheriff�s Office has a deputy at the snowmobile parking lot location to stop unauthorized traffic from going beyond that point. The fire camp is located at the snowmobile parking lot area. Public traffic is still able to get to the Jim Bridger Estates/Beaver Rim area, and the cut-off road between Horse Creek and Ryegrass Road. The Ryegrass-North Cottonwood Creek roads are open. There are no trail closures at this time due to this fire. The McDougal Gap road over to Greys River, and access to the Wyoming Range National Scenic Trail, are still open. Recreationists should be aware that the fire is progressing in that direction and stay posted to current fire activity reports if they plan to be in those areas. We have posted several photo galleries over the past week showing fire activity. Many photos have been sent in by locals and show various angles of the fire. Many thanks to everyone who has shared their photos with us! Attention Media: Media is welcome to use photos labeled as a Pinedale Online photo or by Dawn Ballou, for your web or TV news story purposes reporting on this fire. Please give photo credit to Pinedale Online and we�d appreciate a hotlink back to our website, http://www.pinedaleonline.com. If you need higher resolution versions of any of these photos for your particular purposes, e-mail us, support@pinedaleonline.com, and we can send high res versions. Photos by other photographers that are used in articles or displayed on this website are copyrighted by them and you need to contact them for permission to use them. Please contact us if we�ll be happy to get you in touch with the photographer for photo use permission for your particular use request. We are happy to share photos, and it helps keep unnecessary traffic out of the fire area and off our remote, rural roads if we can help you out with your needs for photos for media purposes. So please do ask if you would like to use any of these pictures. Usually there is no charge for media use purposes. 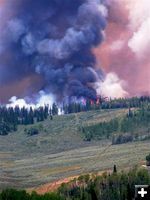 Big Piney, Wyo: The Horse Creek Fire, located 27 miles west of Pinedale, continued to burn aggressively on Wednesday due to sporadic winds, low humidity, and very dry burning conditions. The fire is now estimated at 5,363 acres, burning primarily to the southwest. The fire spread south of Pass Creek and is now well established in Elk Creek. Fire managers hope to resume burn out operations on Thursday and Friday on the northern and southern flanks of the fire. 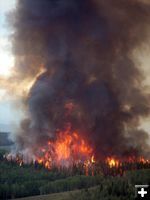 A burn out operation involves setting fire inside a control line to consume fuel between the edge of the fire and the control line. �A much needed stabilizing to a southwest wind pattern instead of the variable flow would greatly aid in the containment efforts. This pattern should set up tomorrow,� said Incident Commander Merrill Saleen. Six lightning strikes were reported south of the fire on Wednesday. Currently there are 363 firefighters battling the blaze, including 11 crews, 4 helicopters, 15 engines and 2 water tenders. Smoke in the air over Pinedale will continue to be a factor as a high pressure system with hot temperatures, low humidity, and a Haines index of 5 is predicted for Thursday. There is one structure threatened by the fire and structure protection is in place. The Horse Creek Road is limited to all but authorized fire personnel. The cause of the fire is still under investigation. For more information, visit www.inciweb.org. 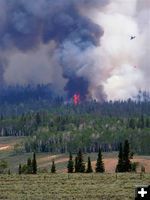 Horse Creek Fire is burning on the Bridger-Teton National Forest in the Big Piney Ranger District in Wyoming. 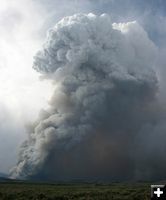 The fire started at 3:00 p.m. Thursday, June 21, 27 miles west of Pinedale off the Horse Creek Road. There is one structure threatened and structure protection is in place. No trail closures are expected at this time. The Horse Creek Road is limited to all but authorized fire personnel only. The cause of the fire is currently under investigation, and the fire danger for the Bridger-Teton is listed as high. Saleen�s Type 2 Incident Management Team assumed management of the fire at 6 a.m. on June 26, 2007. Status: Size is 5,363 acres and is 15% contained. There are approximately 363 fire personnel assigned to the fire. These include 15 engines from US Forest Service, Sublette County, and National Park Service. Four helicopters a Type I, 2 Type II, and a Type III. Five Type I hand crews, 6 Type II hand crews, two water tenders, and various overhead. Objective: Implement tactics and strategy that are cost effective and take advantage of cost containment opportunities. Fire Behavior: Fire behavior was active with yesterday with sustained group torching and upslope runs on the southwest side. Spotting up to a quarter mile was observed. Events: Much needed stabilizing wind pattern from the southwest instead of the variable flow. The control line and natural barriers on the southwest were compromised by very active fire behavior. Fire continues to spread to the southwest into Elk Creek. Today�s Strategy: Prepare roads for burn out operations on the southwest and northeast perimeter. Continue to improve anchor points and extend direct attack on the northwest, and east sides. Forecast: Expect fire behavior to be active early in the day due to poor relative humidity recovery and stabilizing winds from the southwest. Potential exists for short range spotting. Haines index of 5 is expected for today with a potential for plume dominated fire growth. Closures: The Horse Creek Road is limited to authorized fire personnel only. No trail closures are in effect at this time. There is one structure threatened and structure protection is in place. Burn Out Torching Back burn started west of the Antelope Run Ranch on Wednesday, June 27th to prevent the fire from threatening a private home. Photo by Kirby Hedrick. Wall of flame and smoke The fire moves as a wall of flame and smoke through the trees. Photo by Heather Kavran. Close to home Flames creep perilously close to an expensive home. Firefighters and equipment are at the homesite doing structure protection. Helicopters and fixed wing airplanes are actively tracking the fire's progress for fire control measures. View looking north from the Ryegrass-North Cottonwood Road. Photo by Dawn Ballou. Fire on ridgetop Trees torch on a ridgetop on the southeast edge of the fire on Wednesday afternoon. This is about 1/4 mile away from a home. Photo by Dawn Ballou. Black smoke Thick black smoke rises as trees torch. Photo by Dawn Ballou. Fire near ranch The fire's edge moves closer to a ranch on Wednesday. View looking north towards Horse Creek. North Cottonwood Creek is in the foreground. View looking north from the Ryegrass-North Cottonwood Road. Photo by Dawn Ballou. Helicopters over the home There are three helicopters working the fire and helping to protect this home, along with crews and equipment on the ground. Photo by Dawn Ballou. Flames near ranch and home Green irrigated pastures will likely serve as a good buffer to protect this ranch, on the left. The home on the hill on the right, near the trees, is threatened. Photo by Dawn Ballou. Torching Trees Trees explode due to the intense heat, putting up thick black smoke. Photo by Heather Kavran. Horse Creek Helicopter A helicopter takes a bucket of water to a hot spot on the fire. Photo by Heather Kavran. Ridgeline torching Trees torching along a ridgeline. Photo by Heather Kavran. Ground smoke Thick smoke spreads across the ground around the main column. Embers carried up in the column can land 1/4 to 1/2 mile away starting new spot fires around the main front of the fire, making it difficult to get a fireline around the blaze. Photo by Dawn Ballou. Thick Smoke Thick dense smoke is pouring from this fire. Photo by Allene Dana. Flying to hotspot A helicopter takes a bucket of water to another hot spot. Photo by Heather Kavran. Scout Scout planes look for spot fires and check on the fire's progress. Photo by Dawn Ballou. Scout Plane The scout plane flies around the huge smoke column. Photo taken Wednesday afternoon, June 27. Photo by Dawn Ballou. Plane speck The spotter plane is just a small speck next to the huge column of smoke. Photo by Dawn Ballou. Torching Trees torching. Photo by Heather Kavran. 2 Helicopters Two helicopters fly around the southwestern edge of the fire as it progresses towards South Horse Creek drainage. View looking northwest from the Ryegrass-North Cottonwood Road. Photo by Dawn Ballou. Black Cloud Photo by Heather Kavran. Towards South Horse Creek The fire is moving towards South Horse Creek drainage. Photo from Wednesday afternoon around 5 PM, taken from the Ryegrass-North Cottonwood Creek Road. Photo by Dawn Ballou.